The first time Pass documents were used to restrict the movement of non-European South Africans was in the early 1800’s. However, slaves at the Cape had been forced to carry Passes since 1709. Farmers at the Cape ran short of labour during the first British occupation of the southern tip of Africa in 1795, with its subsequent abolition of slavery in 1808. Until that time Dutch farmers employed by the Dutch East India Company (VOC) supplied fresh food to passing ships using slave labour to stock up the refreshment station. They could still sell slaves within the colony, but were prohibited from importing new slaves. The settlers and government turned to the indigenous Khoikhoi people to fill the labour gap. Local farmers began employing more local Khoikhoi people when they ran short of labour at the Cape. The Khoikhoi had lost their land to the colonisers in the late 1700’s and were forced to work for European landowners to survive.The colonial government turned a blind eye to the widespread mistreatment of Khoikhoi workers. These workers had to carry ‘permission documents’ from their employers allowing them to leave the farms they worked on. The arrival of Christian missionaries brought about slight improvements following criticism of the treatment of the Khoikhoi. Eventually, Ordinance 50 was published in 1828 placing the Khoikhoi on equal footing with their White employers and freeing them of having to carry passes. The 1820 settlers were accommodated in the new town of Bathurst in the Eastern Cape and needed passes to travel to nearby Grahamstown. In 1820 a group of British settlers arrived at the Cape to make a new life for themselves. They were disillusioned with unemployment and poverty in England, and were willing to defend the eastern frontier of their Cape colony. Approximately 4 000 settlers arrived at Algoa Bay in April 1820 with more following over the next three months. The voyage lasted about 4 months and during this time disagreements and friction arose among the settlers. British authorities at the Cape wanted to keep the group together in their new town of Bathurst and instituted pass laws in May 1820 to control vagrancy. The settlers could not move from Bathurst to Grahamstown without written permission from local authorities. Travelling further than this required a district pass that had to be approved by the Governor. These restrictions caused 60% of the settlers to move to other parts of the country in defiance. Large numbers of Black and Coloured people moved to Bloemfontein, the capital of the Orange Free State. Local government aimed to control them by forcing them to carry passes. The Boer Republic of the Orange Free State was the first independent Voortrekker state and came into being during the signing of the Sand River Convention by British and Boer representatives in January 1852. The Basotho, under Moshoeshoe, the Barolong, other smaller Black groups and Voortrekkers initially all lived in harmony in the Republic and by 1880 the capital city, Bloemfontein, had a population of 2 567 people, of which 1 688 were of Caucasian race. Most of the population was rural, but towns provided better work opportunities and local inhabitants began moving to towns to look for work. Local and national government tried to dissuade Black and Coloured people from moving to towns, but some were required to work in urban areas. They were housed in locations with few facilities on the outskirts of towns, away from White areas and were not allowed to vote. Vagrancy laws also forced them to carry Passes and restricted movements and travel. Pass laws in the Transvaal, or South African Republic, were intended to force Black people to settle in specific places in order to provide White farmers with a steady source of labour. This Boer Republic came into being in September 1853 and covered the area north of the Vaal River, later known as the Transvaal. The area had a large and rapidly growing Black population. In 1852 there were 15 000 White settlers and 100 000 Black residents between the Vaal and Limpopo Rivers and in 1880 these numbers grew to 43 260 and 773 000. This led to conflict over grazing and hunting rights. Only White people were allowed to vote and own property in the Transvaal and expected Black people to work for them. Many Voortrekkers settled close to large concentrations of Black people to have access to a large labour pool, but also aimed to control the movements of their neighbours. In 1866 a Pass law was passed. Any Black person found outside the allowed residential area without a Pass from an employer, a magistrate, missionary, field cornet or principal chief could be arrested. The first South African diamond, the Eureka, was found in Hopetown in 1867. In the following year thousands of prospectors and miners streamed into the area. In 1867 Erasmus and Louisa Jacob discovered the first diamond in South Africa on their father’s farm near the Orange River and Hopetown. Although the authenticity of the gem was verified the diamond rush only began in earnest in 1868. By 1870 there were approximately 10 000 diamond diggers in the area that would become Griqualand West. More discoveries rapidly followed and fortune hunters streamed into the country from all over the world to live in squalor and prospect for and mine diamonds. The diamonds were found in gravel deposits below the surface of the ground. Diggers had to employ helpers to guard their claims for fear of theft. A labour shortage soon developed and the Pedi, from the Transvaal, provided most of the migrant labour in exchange for guns. Black and Coloured people were allowed to buy claims and digger’s licenses but were resented by their White competitors. Although all workers had to be registered only Blacks were really forced to carry Passes at all times. Thousands of Black men streamed to goldmines on the Witwatersrand to make a living. They were housed in compounds, had to carry passes and were separated from their families, who were not allowed to visit them. Black inhabitants of southern Africa had been mining and working gold for centuries before the arrival of European colonisers. They found gold in rivers and streams and British immigrant Edward Button discovered the first subterranean deposits in 1871 in the eastern Transvaal Drakensberg. Another Brit, George Harrison, found the richest deposit in 1886 on the Witwatersrand. Laws relating to the new mining industry were immediately put in place and specified that no Coloured, Black or Indian person could work or live on a mine except as the servant of a White man. Gold was more difficult to extract than diamonds and the labour needs of the new mines far exceeded that of the diamond diggings. Black people were already used extensively as labourers and tenants on wealthy White farms and, with large harvests, could survive off the excess of their employers’ harvests. Some White farmers found this objectionable and complained to the Transvaal government. The authorities capitulated and passed a law that limited the number of tenants on a farm to 5, forcing large numbers of Black people from their homes and land. Young men from all over the country came to the Witwatersrand goldmines under duress. They had to make a living, but the conditions they had to live in were misrepresented. Overcrowding and poverty made it extremely difficult to leave the mines once they had arrived. Landless, poor and without any means to practice subsistence farming these people were forced to seek out wage paying jobs. The labour requirement of the growing number of gold mines forced mine-owners to actively recruit Black workers through agents that received a fee for each worker they were able to recruit. They lied about living and working conditions, as well as wages, in order to convince Black men to work for the mines. Once the worker arrived at the mine he would be kept there for as long as possible. White workers were allowed to move to homes in the greater Johannesburg area with their families, but Black mineworkers were housed in compounds on the mines’ premises. A Pass system was rigorously enforced to keep the men inside their designated areas and prevented the workers’ families from visiting them. Louis Botha was appointed as the first Prime Minister of the Union of South Africa. On 31 May 1910 the British colonies of the Cape Natal, Orange Free State and Transvaal became the Union of South Africa under Prime Minister Louis Botha. The new dispensation did not make any drastic changes and Black people retained the same inferior status they had under colonial rule. Labour was a specific area of discrimination and in 1911 the Mines and Works Act reserved certain skilled positions for Whites. The Native Land Regulation Act of the same year made it law for Black people injured in industrial accidents to receive less compensation than Whites. They would also be held criminally responsible for strikes and any breaches of their work contracts and could not join the military. Pass laws also remained in place and in May 1918 Black workers embarked on strike action against low wages, poor housing and Passes. The Bantu Women’s League, precursor of the African National Congress Women’s League, also led an anti-Pass campaign during this period. The Union government experienced internal conflict, specifically between Botha and cabinet member J. B. M. Hertzog. Hertzog, the founder of the National Party (NP) in 1919, was an intense Afrikaner nationalist and promoted the idea of racial segregation of Afrikaners, English, and Black residents of South Africa. In 1924 the NP won the general elections with the assistance of the Labour Party (LP). The new Pact Government under Hertzog held power until 1929. It was a time of economic development and industrialisation with a bias towards White workers. Hertzog’s drive to elevate the Afrikaner went hand-in-hand with the subjugation of Black South Africans. The Industrial and Commercial Workers Union (ICU) and the Communist Party of South Africa (CPSA) joined forces in a Pass burning campaign in 1930. The Great Depression, which lasted from 1929 to 1932, had far reaching impact on the entire country. White and Black were plunged into extreme poverty, but the government focused on alleviating the plight of Whites while ignoring Black suffering. Increasing numbers of Black people moved to urban areas in a bid to survive and Pass laws were strictly enforced. This did not stem the tide of desperate people. In 1930 the Communist Party of South Africa (CPSA) and the Industrial and Commercial Workers Union (ICU) began a Pass-burning campaign for the 16th of December when Black and Indian people all over the country would gather to burn their Pass Books. In Durban police stormed the protesters and ended up killing four people. The Pass burning continued until February 1931 when the campaign was crushed. In 1929 the issue of colour was overtly used as a campaigning tool in national elections for the first time. Hertzog represented the NP as the champion of White South Africa. Voting for the NP meant voting for a White South Africa. Once he obtained victory Hertzog turned his attention to attaining full independence from Britain. The Pact government remained in power until 1934, when the NP forged a bond with the South African Party under Jan Smuts in order to ensure victory and the Fusion or Coalition government was born. It remained in power until 1939 when it broke apart as a result of disagreements regarding participation and neutrality in the Second World War and Hertzog resigned from his position as Prime Minister, leaving Jan Smuts to take over his responsibilities. Administrating Pass laws was costly and difficult because all Black people in urban areas had to be checked by authorities. The constant humiliation and monitoring caused intense anger in Black communities. From 1939 to 1948 South Africa participated in the Second World War and benefited from new war economy. Black families began migrating to cities as a result of increased job opportunities and the grinding poverty they were experiencing in rural reserves created for them through the 1913 Land Act. The urban Black population of the country virtually doubled from 1939 to 1946. In 1942 Prime Minister Smuts appointed an Inter-Departmental Committee on the Social, Health and Economic Conditions of Urban Natives to be chaired by the Secretary of Native Affairs, Douglas Smit. In his report, which was presented in the same year, Smit stated that Pass Laws inspired a “burning sense of grievance and injustice” in Black South Africans. He added that it would be better to face the results of the abolition of Passes than continue to enforce them because it was politically and administratively too expensive. Although this seemed like support for the removal of Pass laws, control over the movements of Black people would continue. A network of labour exchanges in urban centres, where all contracted Black employees would be registered and curfewed, would replace them. These measures amounted to Passes with another name. Malan, Strijdom and Verwoerd all supported and perpetuated apartheid. The unprecedented labour demand sparked by the Second World War forced the government to slacken entry control laws and to debate the revision of Pass laws. The 1946 Fagan Commission, under Judge Henry Fagan, was appointed to address this issue. Although the Commission recommended that Passes be abolished they remained in place. On 26 May 1948 the Herenigde, or Reunited, National Party (HNP), under D. F. Malan, won the national general elections ushering in the era of apartheid. Malan was determined to implement his policy of separate development under the backdrop of Afrikaner Nationalism and he did so with great success until his retirement in 1954. He also merged the Afrikaner Party (AP) with the HNP, to once again establish the National Party (NP), consolidating Afrikaner support and eliminating competition for Afrikaner votes. J. G. Strijdom replaced him as Prime Minister and the NP continued to expand. On Strijdom’s death in 1958 H. F. Verwoerd took over the reigns. The Separate Amenities Act separated the residents of South Africa through forcing different races to use separate public facilities. Strijdom’s tenure as Prime Minister cemented the apartheid policies that Malan had initiated through legislation. Malan passed the Prohibition of Mixed Marriages Act in 1949 and in 1950 the Immorality Act became law. This year also saw the passing of the Population Registration Act, which established a national registration process to classify people according to their race. At the same time Group Areas Act came into existence which physically and spatially separated White, Black, Coloured and Indian people. The Separate Amenities Act, which was passed in 1953, completed this separation by forcing different race groups, European and Non-European, to use separate facilities and so creating racial inequity through the establishment of services based on what was deemed to be appropriate for each race group. A hated law passed during this period was the Natives (Abolition of Passes and Co-ordination of Documents) Act of 1952. This forced Black South Africans to carry a range of documents, including a photograph, place of birth, employment records, tax payments and criminal records, and enabled the government to further restrict their movement. It was illegal to be without a Pass the penalty for which was arrest and jail. The Natives (Prohibition of Interdicts) Act of 1956 removed all legal recourse for objecting to the removal of Black people from certain residential areas. The Urban Areas Act limited Black people to 72 hours in an urban area without permission from a specific municipal officeholder. Dissatisfaction of Black South Africans grew to unprecedented levels. Popular resistance spread and in 1949, after the elections, the ANC launched a militant, armed anti-apartheid campaign through its Youth League for the first time since its birth in 1912. Strikes and marches began in earnest and police retaliation was brutal. Clashes and repression continued through the following 3 decades. Malan’s ambitions for the Afrikaner nation included full independence for South Africa from Britain. He passed the South African Citizen Act in 1949, removed the British Privy Council in 1950, introduced a new anthem and flag and set the stage for South Africa to become a republic. Strijdom advanced on this effort. Verwoerd took the practical steps to make it a reality with growing White support for apartheid and against increasing international condemnation and isolation. In 1960 Verwoerd decided on a White referendum for 5 October to decide on the establishment of a republic. A majority voted in support of him. In March 1961 Verwoerd attended the Commonwealth conference in London and was forced to withdraw South Africa’s membership following criticism from other members. Legislation to establish a republic had already been tabled in January 1961. On 31 May 1961 the Republic of South Africa (RSA) came into being. In 1966 a Parliamentary messenger called Dimitry Tsafendas stabbed and killed Verwoerd in Parliament. Under the new republic the suppression of Black South Africans continued unabated. The RSA became increasingly isolated from the rest of the world as a result of its apartheid policies and Black resistance soared. The 1970’s were marked by turbulence and insecurity as apartheid was met at every turn with popular mobilisation and response. International outrage grew and events like the 1976 Soweto Youth Uprising earned the support of the international community for the cause of freedom in South Africa. The country’s relationship with its neighbours also worsened severely as a result of the government’s efforts to secure minority White rule by way of manipulating politics beyond its own borders. On 6 September 1966, a uniformed parliamentary messenger called Dimitry Tsafendas assassinated Verwoerd in Parliament. B. J. Vorster, Minister of Justice since 1961 took his place as Prime Minister. He ruthlessly continued Verwoerd’s implementation of apartheid policies. He resigned from his post in 1978 and became figurehead position of President. His successor, P. W. Botha, became the first Premier forced to temper apartheid. He was motivated by growing economic crisis and forced to implement major reforms to address the situation. Previous leaders had hoped that decline in urban Black locations would force development within the homelands and attract people to them. This strategy failed and Black people continued to stream to urban areas in a bid to escape the grinding poverty of the reserves. Botha’s government granted Black workers the right to form unions, but demanded that all unions, registered or not, hand over membership registers to the state. This in effect negated the right to unionise because of the exposure of individuals to state security for surveillance and repression. Botha also implemented some constitutional change as part of his reform measures. The 1961 constitution made the head of state position more symbolic than politically potent. Botha reviewed this in a new constitution enacted in 1983 following a white referendum in 1982. He became South Africa’s first State President with full political power. Black protest escalated and Botha declared a State of Emergency in July 1985 to crush the violence. This failed. Botha’s “Rubicon “ speech was received with international contempt. Efforts to control urban Blacks had proven hopeless and the government repealed the Pass laws on 23 July 1986. From 1800 between 15 and 20 million people had been arrested and for violating these laws. Pass laws inspired several resistance campaigns. Before South Africa’s transition to a union in 1910, protest against colonial laws seemed futile. In March 1912 a group of Black and Coloured women from the Orange Free State sent a petition against passes signed by 5 000 people to Prime Minister Louis Botha. After failing to receive a response 6 women were sent to meet with Henry Burton, the Minister of Native Affairs. Again they were ignored and by May 1913 they decided to pursue more aggressive anti-Pass campaigns. On 28 and 29 May they resolved never to carry Passes again and said, “We are done with pleading, we now demand!” This passive resistance campaign was met with arrests in Bloemfontein, Jagersfontein and Winburg, in the Orange Free State. In 1914 the government relaxed Pass laws for women and the resistance campaign ended. Charlotte Maxeke and the Bantu Women’s League launched an anti-Pass campaign in 1918. They hoped to force the government to abandon the use of Passes for women completely. In May 1918 Black workers across the country went on strike against low wages, poor housing and Passes for men. Many of the protesters were arrested and imprisoned. The Bantu Women’s League, that preceded the African National Congress Women’s League, under Charlotte Maxeke, launched a campaign to end the use of Passes for Black women completely. The Communist Party of South Africa (CPSA) launched an anti-pass campaign in 1943. In March 1944 labour activist, Josie Palmer convened the Women’s Anti-Pass Conference in Johannesburg. In 1945 the Urban Areas Consolidation Act was passed, further limiting the freedoms of Black South Africans. At the 1947 International Women’s Day meeting in Johannesburg, the CPSA decided to launch a “non-colour bar women’s organisation”. The Transvaal All-Women’s Union was born, changing its name to the Union of South African Women in 1949. It never grew to become a national group, but Palmer later helped found the Federation of South African Women (FEDSAW). 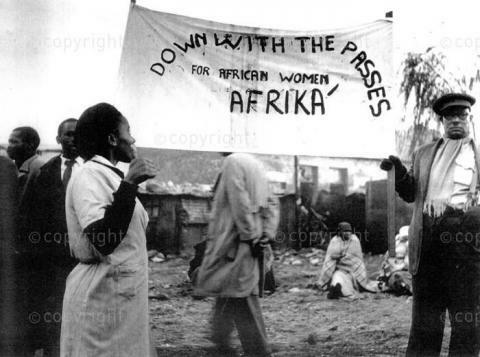 The Federation of South Africa Women (FEDSAW) was instrumental in the 1956 Women's March against Passes in Pretoria. Passes gave rise to great protests from women during the 1950’s. In 1950 proposed changes to the Urban Areas Act were leaked to the public. The changes involved further restrictions on Black women and a more efficient Pass system to facilitate this. South African women protested vehemently. The ANC Women’s League attracted a huge following with this politicisation of Black women. In April 1950 Bertha Mkhize, Provincial Secretary of the ANC Women’s League, declared, “Our fight is on” precipitating a major anti-Pass campaign. Anti-Pass campaigns took place across the country. National demonstrations and protest meetings made the news in The Guardian with headlines like “We will not carry any Passes: African women indignant”, “African women up in arms, mounting opposition to Passes for women” and “Campaign against Passes for women gathers force”. Faced with such an onslaught the government decided to put off Passes for women. When the proposal resurfaced in 1952 protests were launched in Cape Town, Cato Manor, Port Elizabeth, Oudtshoorn, Stellenbosch, Ixopo and Umzinto. In September 1955 the government announced it would begin issuing Passbooks for women in January 1956. This sparked more resistance and women in the Transvaal began planning a mass demonstration at the Union Buildings in Pretoria to take place the following year. This event was preceded by a mass demonstration organised by FEDSAW of more than 2 000 women of all races on 27 October 1955. On 9 August 1956 more than 20 000 South African women gathered to march to the Union buildings to hand a petition to the government demanding an end to Passes. • Cameron, T. (ed) 1986. An Illustrated History of South Africa. Johannesburg: Jonathan Ball. • Saunders, C. (ed) 1988. Reader’s Digest: Illustrated History of South Africa: The Real Story: Cape Town: Reader’s Digest. • Gordon, R.E., Talbot, C. J. 1983. From Dias to Vorster. Cape Town: Nasou. • Saunders, C., Southey, N. 1998. A Dictionary of South Africa History. Cape Town and Johannesburg: David Philip. • Eybers, G. W. 1918. select Constitutional Documents Illustrating South African History 1795-1910. London: George Routledge & Sons. • Gary Baines. Revisiting Urban African Policy and the Reforms of the Smuts Government, 1939-48. Workshop on South Africa in the 1940s, Southern African Research Centre, Kingston, September 2003 (published online).